Mario Puga was born in Mexico City in 1974 and moved to the United States when he was sixteen. He has been living on Johns Island with his wife Alma López since 1995. In this interview, he reflects on his involvement with community groups like the Rural Mission and Our Lady of Mercy Community Outreach. Both organizations serve the many needs of migrant workers and permanent residents of the Sea Islands. Selection from interview with Mario Puga by Marina López, 3 October 2014, courtesy of The Citadel Oral History Program, Lowcountry Digital History. Clip from original interview minutes 40:10-49:18. To access the full oral history and transcript, click here. 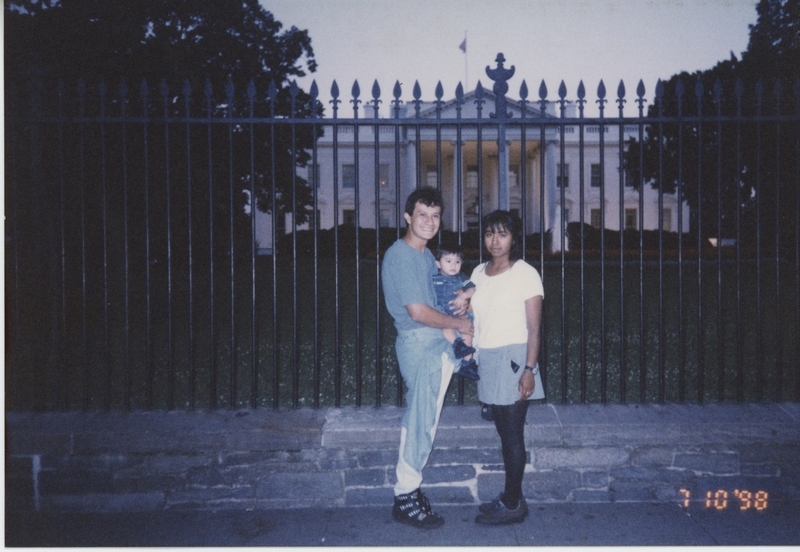 Mario Puga and Alma López outside of the White House, Washington DC, 1997, courtesy of Alma López. Mario Puga was selected to go to Washington, DC for a meeting as the representative with Rural Mission Head Start. Rural Mission is a Lowcountry-based nonprofit organization that addresses the needs of those living in poverty on South Carolina's coastal islands. Mario Puga: After we got married, we were involved with a group called Rural Mission in their Migrant Head Start program. They have a parents group. Parents can vote on the institution’s decisions. This was the second group that I got involved with. We went to Washington and we asked the Congress of the United States for ninety-two million dollars to run the institutions, the Migrant Head Start, East Coast Migrant Head Start. And I learned more or less how these types of organizations or committees are run, and what a board does, about bylaws, procedures, and everything else that committees or boards are involved in. Since then, we have participated in “pro” marches, how do you say it? To have immigration reform, pro-immigration reform. We have participated in church events—raising funds. Now, I’m not Catholic, but I participate anyway. I believe Sister Mary Joseph from Our Lady of Mercy has had a big impact on us. She is one of the people who helped us the most to learn how to conduct ourselves, because hers are not lessons from a book, she is a role model. She is a Christian nun, but she works with people from other religions and she taught us to tolerate all cultures. She had always defended specifically those who are the most in need, both Hispanics and African Americans. I believe that we have learned from her way of life, her character, how to lift up, not only an organization, but that as she does with her character, her way of life you can be a role model for others. Marina López: You told me that you arrived in the United States without documents, right? ML: And you have participated with Head Start in Washington and in marches that are, I imagine, for the rights of immigrants also here in Charleston? MP: Yes but they were specifically for, how do you say, when we went to marches downtown they were for the success of the immigration reform. ML: There was a march when South Carolina was passing its immigration law. The people did a lot to challenge the law in Federal Court. You went to that march? ML: There are a lot of people who prefer to stay in the house, a lot of people who say, “It’s a big risk to go out of the house for someone who doesn’t have papers. It is a big risk to talk; it is a big risk to show my face.” Why did you both dare to go out? MP: I believe that being united makes us strong. Going out there with a lot of people, it is less likely that you will be the target of hatred and that others will go against you. It would be different if you were alone, right? Second, we are educated about what we are, like our rights as human beings, our rights as individuals, and the right to be humans. The same way, we have the right to demonstrate, that it is not a crime. It does not have to be repressed by any authority. It is a right, even if we’re undocumented. And so, as people, we have to educate ourselves to know our rights and from there propel others forward and let them know they have rights too. That they can travel the streets and the police cannot take you just because they want to. They have to have a reason to take you. All of this is partly due to our education and the knowledge we are acquiring. And, why not? Our status should not prevent us from going out—having a demonstration when we disagree with something. ML: How do you participate, Mario? You have some form of group with whom you discuss these things, who organizes things, or is just because the people get together and talk when they go to church? How are things evolving on Johns Island? MP: Well first of all, like I told you, we are not natural leaders. This is a learning process and it evolves according to the circumstances. A phenomenon exists among the Hispanics here on Johns Island, those who have already established themselves, those who have improved themselves in their education, those who know their rights. They organize. They advance day by day. I believe this effort exists here on Johns Island. Many Hispanic people here already have papers and there are those who don’t have them, but they have the spirit of success. They are getting together. They are organizing. Maybe at the beginning it is just for religious purposes. But some are also getting involved in politics, and their own education. This movement exists and I believe everybody is improving. And for us, in our case, we go step by step because we have family, we have work, we have the desire to improve ourselves, but we do what we can. Regarding organizing, we still have much to do within the Hispanic community, not only in the Charleston area, but in other parts of South Carolina as well. There are organizations, but they need a lot of support and they don’t know how to go forward. That is what I’ve heard more or less. In the course of his community work, Mario met an unexpected ally, Kay Wang, a police officer who was feared by many people in the community. Despite his reputation, Wang supported legislation that would allow undocumented immigrants to obtain driver’s licenses. Selection from interview with Mario Puga by Marina López, 3 October 2014, courtesy of The Citadel Oral History Program, Lowcountry Digital History. Clip from original interview minutes 49:20-59:45. To access the full oral history and transcript, click here. Marina López: Could you tell me about your most recent community work? Because you have been involved in a very important initiative, one thing that many people would like to happen here in South Carolina, right? He met with several people and was investigating what he could do as an official to introduce a bill to change all of this. Because many states already recognize that they have many undocumented people, and that is better for the public safety, the state security and national security, to give people a way to provide their name and identity. They give licenses to undocumented immigrants. Wang wanted to implement – he wants to implement this, the same idea in this state. He researched how he could do it at the Charleston County Legislative Delegation Office, and he was told he could introduce an idea to the lawmakers and they could take it and introduce the bill. He approached many Hispanic leaders and many religious leaders, but because they have their own agendas, it was not convenient for them to give him support. Their agendas are different, whether political agendas or religious agendas. ML: Hispanic leaders, did you say? MP: Yes, these Hispanic leaders. But he did not quit and he remained motivated. With the few people who supported him, he held a meeting. On September 19, 2014, he presented his idea to Charleston District legislators, and asked if somebody could take the idea and write a bill? And one of the lawmakers accepted and he is working with a small group Hispanic people to see if they can write legislation that can be presented in January 2015. Because of the elections of November 4, there won’t be meetings until 2015. But by then the idea will be worked out and could possibly become a reality. ML: I remember, before his presentation to the lawmakers, there was a community meeting, right? Did not you organize a community meeting here in the library of Johns Island to talk about this project? MP: We held several meetings in several churches. ML: I remember Alma [López] was in the newspaper. Could it be that Alma was in the newspaper talking about this project? MP: Alma was with the Mayor, right? ML: And how did those meetings with the community work out? And you said that many religious leaders or representatives have refused to participate, and in general how did the community respond? MP: The community wants this. Most are undocumented. They cannot be represented because they must be legal so that they cannot approach a legislator. They need someone who can represent them as Latinos. Most of them are undocumented, so here they decided that the law should be proposed. In the meetings there was a lot of interest from all those who are undocumented. Leaders welcomed it. However, an evangelical leader will put God before human matters. Unfortunate, right? Other people—the right people for this to move forward—are much more involved politically. It seems that they want a political career. They do not want to be exposed to criticism or maybe to be discredited by proposing a law like this one. They do not want to get too involved for precisely this reason. Then, again, their agendas are different from what is being done. Here we can see the poor organization among Hispanic leaders, specifically here in the Charleston area.